The First Judicial District Commission on Judicial Performance unanimously recommends that Judge Verna L. Carpenter BE RETAINED. 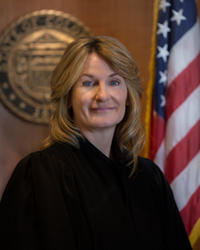 Judge Carpenter received a Bachelor of Arts degree from Metropolitan State College, and obtained her juris doctorate degree from Creighton University School of Law. She was appointed to the Jefferson County Court in 2008. Prior to her appointment, Judge Carpenter was a Chief Deputy District Attorney for the City and County of Denver. She handles a mix of traffic, criminal and misdemeanor cases. She is actively involved in the community. She judges moot court competitions for the University of Denver and the University of Colorado law schools. Judge Carpenter teaches at the National Institute for Trial Advocacy. She is also a member of the Criminal Justice Coordinating Committee and the Interstate Commission for Adult Offender Supervision. Commission members conducted a personal interview with Judge Carpenter, reviewed opinions she authored, observed her in court, and reviewed surveys sent to attorneys and non-attorneys who have appeared in her courtroom. Among the survey questions was “how strongly do you recommend that Judge Carpenter be retained in office, or not be retained in office?” Of those who completed the survey, 70% of attorneys recommended retaining her in office, and 88% of non-attorneys recommended retention. The Commission believes Judge Carpenter to be a hard-working, knowledgeable, dedicated public servant. She receives high scores in the areas of case management, diligence and communications. She is organized, prepared and takes the bench promptly as cases become ready. She sees herself as a team player, and has recently been selected by her peers to be the Presiding Judge of the County Court, which she has enjoyed tremendously. This has given her an opportunity to gain further knowledge of and work more closely with the Jefferson County legal community and to understand the administrative side of the court’s operations. Judge Carpenter is aware that she has consistently received lower than average scores in the area of demeanor. Many see her as condescending to parties in the courtroom. Judge Carpenter is very concerned about this rating and has taken great strides to improve. Most recently she has sought the advice of a senior judge, observed other colleagues on the bench, and taken courses to help her improve. The Commission believes Judge Carpenter wants to become a better judge and has taken appropriate efforts to do so. Judge Carpenter is a great asset to the Jefferson County bench and should be retained.